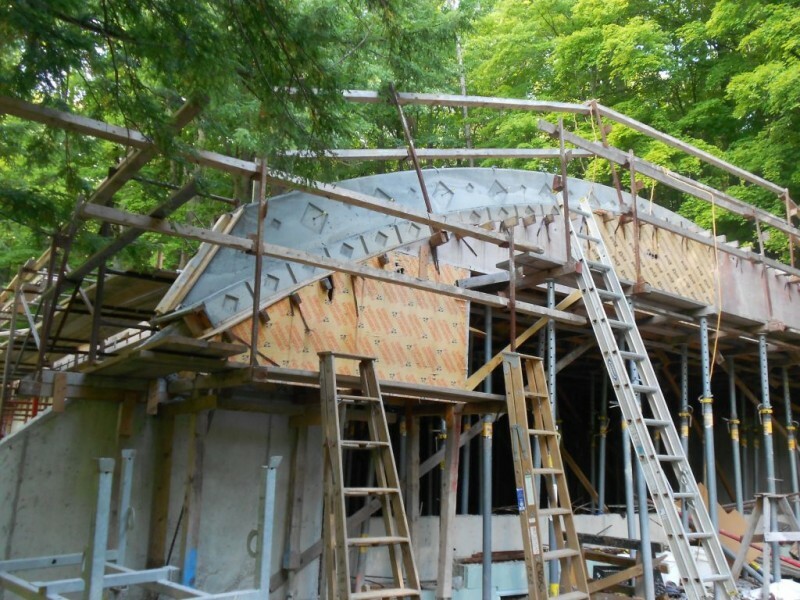 Well, we meet again for another addition of the Hobbit Hollow Construction Blog! Pleased to meet ya. Especially anyone new to the blog. Welcome! So it really isn’t that easy writing a construction blog. At least for me it isn’t…and like I’ve said in the past my English composition book from school always seemed to be riddled with red ink. The run on sentence thing was always a big problem. Among other things. So last week I did my blog thing. ( And just for the record I finished very early) Had the editor review it and then hit publish. So that was Sunday night. Tuesday Terence comes up to me and says: “That blog post was way too long.” I was like: “Okay…but there was kind of a lot of stuff to talk about don’t you think? I mean we did finally pour this Hobbit House roof. I was a little excited.” And then he adds “and you should have put more pictures in it.” What do I look like…an octopus? I was doing about eight million things during that pour and Terence wants a picture of himself from his good side. Oh yeah, and as the light is coming up and over the tree line! Jeesh. Then as he’s finishing up his little critique, if you will, the editor steps up to the plate and adds: “Yeah it really was way too long.” Isn’t that her job? Reigning me in a bit? Again….Jeesh. Then she adds “We should have made two posts out of it.” I mean what do I look like Charles Dickens? I’m not that savvy with all that hash tag stuff but I really wish we could do one of those polls they do on the talk shows. You know like text 1 if you agree with Hobbit Hollow Jim text 2 if you agree with the editor and that son of mine who just got axed out of the will. You can’t get an honest answer here anymore. Well that’s not true. I just can’t get anyone to agree with me that’s all. Probably a good thing in the long run though. Oh yeah, and they want a real Hobbit House door on the house as well! Okay, lets get back to what we’re here for shall we people? Just had to throw that in there. Sorry. Oh yeah, one other thing before I get started. I don’t know how it is where you work but where I work a lot of guys have nick names. You know like stupid little names you make up for people. It’s kind of fun. I think it’s an Italian thing though. You know mob bosses and their cronies. Like in the movie “Good Fellas”. “Jimmy the Gent” and all. Some of the nicknames where I work: Hollywood, The Gimp, Boo Boo, Johnny Deck, Chiz, Tommy Debris, Tommy Nose, The Duke, The Cuban, Tommy Rat Patch, and there are others which I cannot mention here because this is a family friendly blog. I have a number of nicknames including but not limited to: Scuba Jim, Super and/or Super Jim. There are variations on those names depending on what’s going on and who’s mad at me at any particular moment. After last weekends pour my knew name is “Mason Killer.” I think Ronnie and Sean wanted to blow up my car. Hey, I never said pouring a Hobbit House roof was going to be easy. Well….I think I said it shouldn’t be that bad….but I never said easy! That being said we began form removal this week. Or should I say the day after the pour. We, we being myself,Jodi, Jude, and Terence, took a drive over to see our handiwork Sunday afternoon. Jude and Terence were like, ” We gotta take a look at something!” So they proceeded to strip off one of the skylight sides. Stripping forms is pretty labor intensive. I didn’t want to break out in a sweat so I let them have at it. Only thing is they stripped the outside form, not the side where the details were. I think if they knew that they might have held back. I wasn’t going to tell them. I’m going to be sick of stripping soon enough. I figured let them strip away! One less thing for me to strip. But I couldn’t help myself either. Monday after work I headed out to the old Hobbit homestead and faced my new challenge. Stripping the formwork that took us nearly a year to put up. Hmmm. Not going to think about this monumental task. 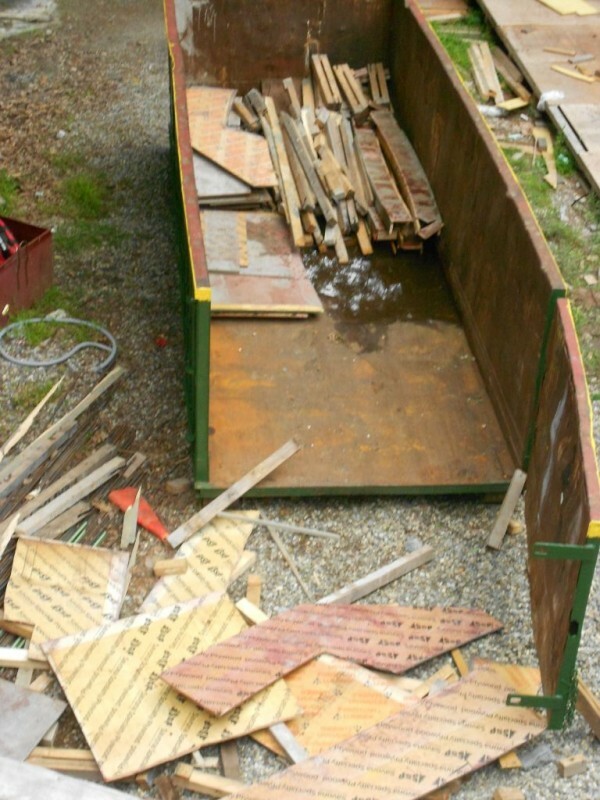 I’m just going to pull one nail at a time….and throw a piece of wood in the dumpster. I ordered up a 30 yard container for delivery Wednesday and had him park it just outside the building line. I called a couple of places and this one place had a pretty good deal for me. There is no time limit on how long you can keep the containier. I think I’m going to need it for at least 3 to 4 weeks. Speaking of which all the hired help went off to college over the last week or so and Terence the Boy is officially indebted to the football program for the fall season. It looks as if I’m all by my lonesome again. Maybe the editor? Hmmmm. Doubtful. Probably have to make some crazy deal with the editor to get her out there to help me. Gonna have to weigh the pros and cons of that before I commit to something like that. Going to have to be real careful though. I don’t wanna wind up with that battle Ax of a mother in law of mine living in my house. That would be a raw deal for sure. Well anyway, I did start the stripping operation and it went fairly well. Had some issues to take care of Saturday so I was only over there for about 4 hours. Like I was saying, I worked after I got home from the city 3 days so I had already gotten a decent start on things. The main thing with the stripping operation is don’t try to over manhandle anything. 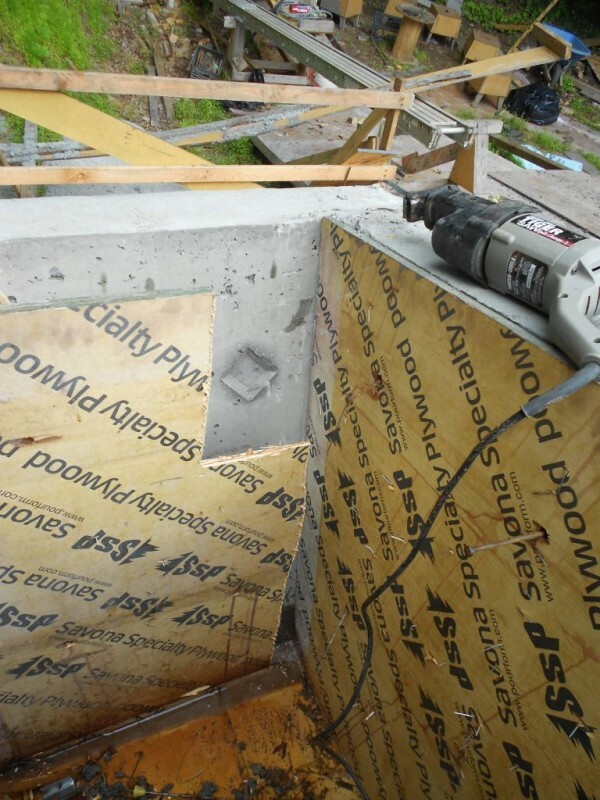 Pull the nails and use your pry bar correctly….and don’t pull really, really, hard on the pry bar. If the wood you’re prying on snaps your gonna go flying. And knowbody I know has wings. That being said it is pretty dangerous work. Lots of wood with nails ready to be stepped on or willing to cut you if you’re not careful. Got a nasty one Saturday, by the way. Was wrestling with the inside face of the skylight. As I was saying there is quite a bit of danger involved here. I don’t know if you remember from last week but I was saying that the pitch of the spandrel at the bottom was like 30 degrees or so. I’m gonna check that today. (After checking it’s a 9 in 12 pitch) You had to be like a billy goat to strip out there. 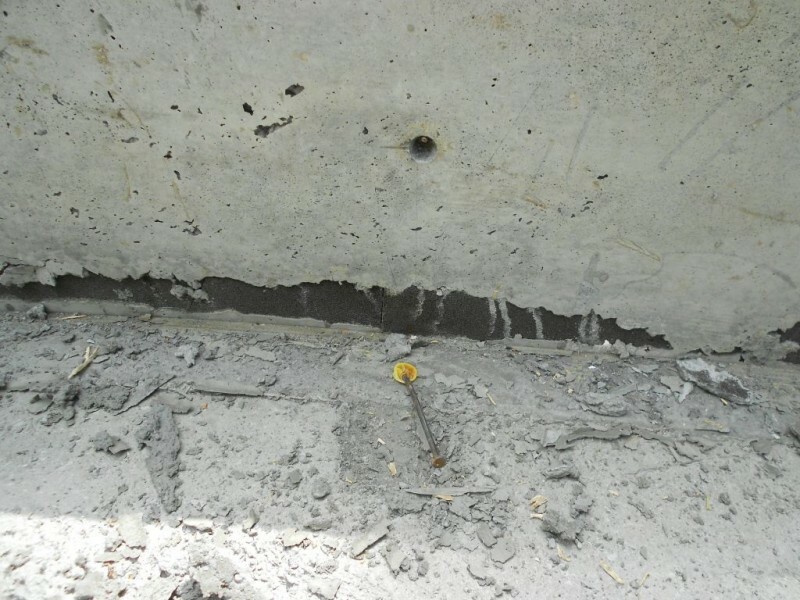 Man, I should have told the masons to put a heavy broom finish on that concrete. 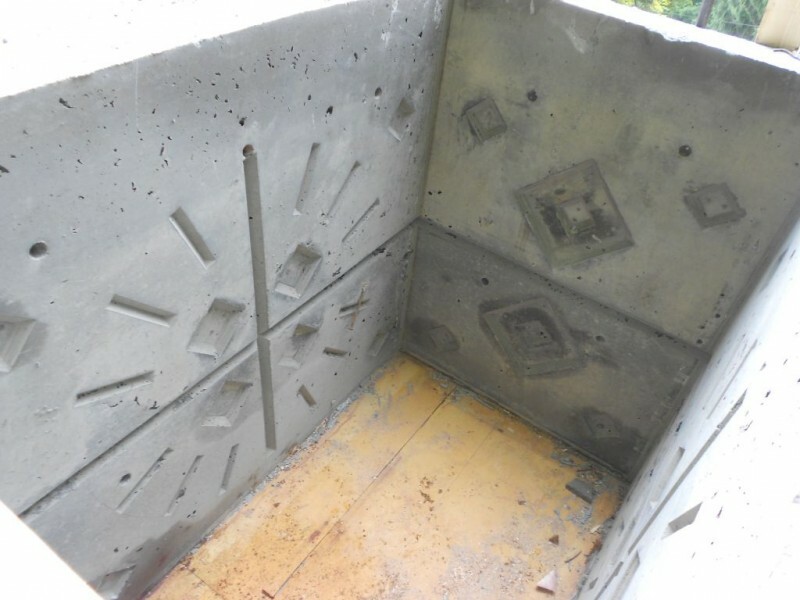 With all the concrete dust and crumbs I was sliding off the spandrel. It was hot when I was working out there and I was sweating like a pig. So we have quite an interesting animal that we need to address our form work stripping operation. A billy goat that can fly and sweat like a pig. Hmmm. Well…..I think I’ve got the last third of that covered. I think I lost 3 pounds sweating this weekend! My wife had this framed for me for my birthday. It came out really nice. 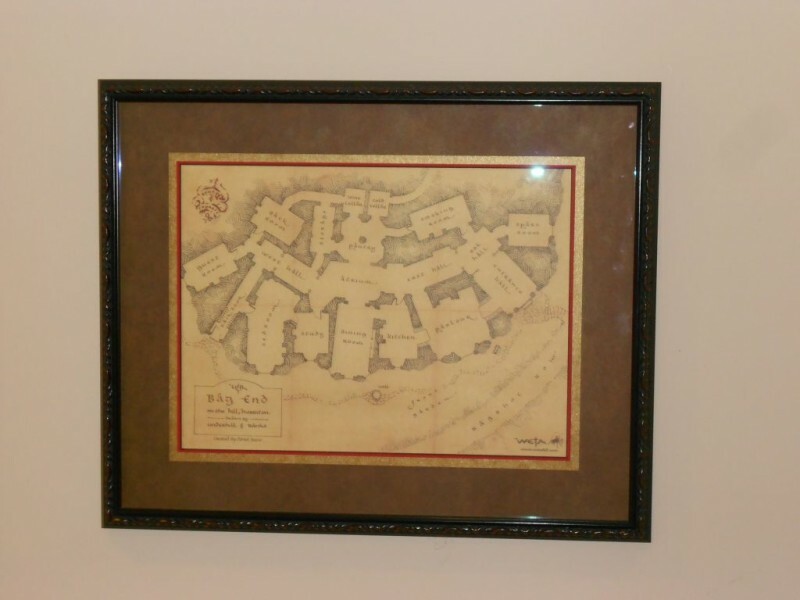 When you’re building a Hobbit House you have to have stuff like this up on your walls at home. I love it! Kind of fuzzy. Let’s try another. Just so you know I stripped all the walers and 1×4’s off first then I pulled the plywood off. Then I threw it over the side. The spandrel edge I stripped off in one piece. After it was loose I cut it into pieces with a skill saw and threw that overboard. So this is a good picture of what we are doing here. Remember we used cone ties in most places. When you break them off the plastic cone comes out and you are left with the cone shaped hole shown in this picture. To break them off you bend them over and hammer them down as shown. Then you twist them in a clockwise or counterclockwise(if your from China) motion and they break off. Notice all the crumbs. Typical crumbs. Watch your step at the steep areas though! Stripping the inner skylight plywood. This operation was intense. It almost got the better of me at one point. I couldn’t get this plywood out. Tried a whole bunch of different things and then realized I gotta break out the handy dandy sawzall! Still tough but I cut a little strip in the corner and worked my way down until I had it out! Not bad! There’s always a learning curve. The next 3 skylights should strip a lot quicker. Oh yeah Terence and I went back Sunday for two hours….so I could put more pictures into the blog .Happy now Boy??? terence throwing a sheet of plywood into the dumpster. Pretty cool shot. My compliments to the photographer. Hmmm…that would be me! We would throw all the stuff down in front of the container and then load it inside nice and neat. Terence eyeing up the North side detail work. So the saga continues on! Once I finish the north side and the skylights we should be able to get into stripping the underside of the deck. Hopefully we’ll start next weekend. On a side note our son Jude (that big old bear)went off to college for the first time and seems to be doing well at Siena College in upstate New York. Ethan is at Cortland and is apparently turning his off campus housing into some sort of ale house. Georgia is about to start her semester of student teaching at MCLA and is enjoying living off campus in her own apartment. Good luck this semester guys! You know mommy and I love you all and wish you all the best! Work hard and have a good time as well! P.S. Terence the Boy redeemed himself a bit today over at the house. He put in a good 2 hours. I think I’ll put him back into the will. Probably a 10% stake. We’ll see how he does next week. I don’t know much about spee.., spiiii, arachnids. Not individual species, I mean. Like every other kind of critter there are some amazing things about spiders. 1) in the classic round spider web (think Charlotte) only the strands forming the circles are sticky. The spokes of the wheel are thicker and not sticky, so that the spider can walk on them when retrieving prey. 3) webs used to be collected and used as a dressing for wounds to encourage blood to clot. 4) there are spiders in the jungles of South America that are so big they eat … birds. And others who live along rivers and catch …. fish. 5) all spiders have eight legs (which is why Daddy Longlegs are _not_ spiders,) spin some kind of web (not always used to catch food,) and have multiple sets of eyes (some of which only see light and dark, not pictures.) Spiders, along with the centipedes, millipedes, crabs, horseshoe crabs, and scorpions, are descended from the trilobites – those small and numerous fossils that look like segmented ovals. Sally! Are you sure you’re not a relative of Marlin Perkins? I’m gonna have to come up with another name for the Hobbit Hollow Construction Blog if we keep getting so much info about the natural world! I guess that’s why they call him the “Amazing Spider Man”! Enjoy your week and thanks for all the fun facts! This is so cool! And amazing! And one of the best reasons to work with concrete :). My children are back in school too. Well, three of the four. The second one actually has a _job_. Very quiet at home with all of them gone. Sally!!! How’s it going! Yes, concrete is very cool. People are just now going to find out how cool it really is. Yeah, the back to school thing. Terence is the only one left. The empty nest thing is going to be tough when it happens. My wife and I are not looking forward to it. Thanks for writing as always! I’ve gotta get Jude to send that spider picture to me so I can put it in the blog. You’ve got to take a look at this thing. I’m really hoping to get the decking down in the front of the house next weekend. I’m gonna get it down if it takes me all weekend. I can’t wait to see how it came out! Take it easy and I’ll see you next week!